"20 Best Fall Vacations In America for Seeing the Colors"
-- Come see the beauty! 27th "Most Beautiful Town in America"
-- Come see if you agree! 4th "Coolest small town in America"
With a history spanning 140 years, the Millsap-Baker Estate offers classic Victorian style and contemporary comforts in a variety of restive suites, perfect for guests of all kinds. Our large estate contains many acres of blissful outdoor wilderness as well as plenty of rustic accoutrements lending a cozy, old-time feel to our entire facility. Not "just a hotel" -- an experience that's part of your vacation! Nestled in scenic Damascus, Virginia, in the heart of the Blue Ridge Mountains and less than 9 miles from historic Abingdon, Virginia, less than an hour from Boone, NC, and less than 2 1/2 hours from Asheville, NC, Pigeon Forge, TN and Gatlinburg, TN, the Millsap-Baker Estate comes to you as a new wedding/event venue, and one of the most elegant Bed & Breakfast in the entire region! No, we're not a hotel or motel, we're so much more -- let your "hotel-stay" be a part of your vacation, with memories sure to last. Rich in history and elegance, our manor house is ready to host the day of your dreams or the vacation stay you deserve. Come stay with family you've never met! Now serving the Gatlinburg / Pigeon Forge, TN wedding community -- the Millap-Baker Estate is a perfect destination wedding site. 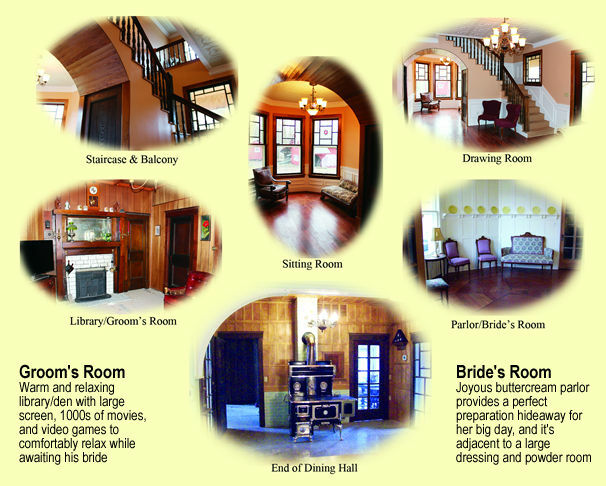 Get married in a vintage 1890 Queen Anne Victorian Manor House, complete with period furniture and antiques OR in the outdoor nature of the Blue Ridge Mountains of Virginia beside the famous Virginia Creeper Trail. Then off to places unknown for your honeymoon, be it Gatlinburg, TN or Boone, NC or your own little secret! Along with our bed & breakfast rates, we offer a wide array of packages for weddings and private events of all kinds, whether indoors or outdoors. We have plenty of affordable party and event packages, but we can accommodate much larger events with even more services, including grounds cleanup, additional overnight guest accommodations, outdoor tents, seating and more! Browse our website to get an idea of wedding packages and other special offers, and contact us today to speak with us at the Millsap-Baker Estate. Viewing by appointment only -- call 276-492-4944.